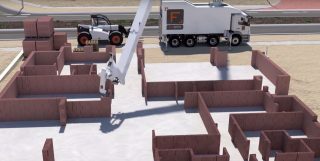 Check out the Hadrian X, a world first digital construction solution, brain child of Australian tech company Fastbrick Robotics. The Hadrian X aims to lead and ‘industry revolution’ by streamlining the end-to-end bricklaying system; including the loading, cutting, routing, and placement of bricks. The automated process is very similar to 3D printing, and should improve the speed, accuracy, cost, and safety of the global brick construction industry. Fastbrick Robotics estimate that the Hadrian X will be commercially available towards the end of 2017. In the mean-time, take a peek at their promotional video here for an idea of what the machine will look like in action.